An aromatic eastern North American herb (Monarda didyma) in the mint family, having colorful, tubular flowers grouped in dense showy heads. Bergamot is all abuzz, both inside and out. From the local produce celebrated on the plate, to cocktails infused with homemade bergamot syrup, to the warm neighborhood buzz you feel upon entering. We opened Bergamot so we could share our love for great food, wine and friends all coming together. We are cooking up Progressive American Cuisine, which just means we’re having fun with the best local produce we can find, complemented by ingredients from around the world, all served with neighborhood warmth. 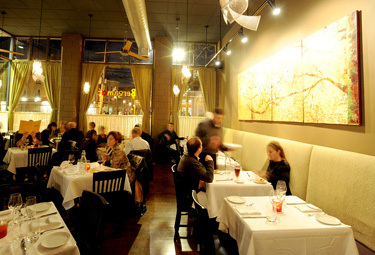 Be sure to ask about our Bergamot Blackboard specials - three courses for $39. Keith changes it several times a week, reacting to our fresh-from-the-farm deliveries for the day. Bergamot is open every night with a full bar, creative cocktails, a great bar menu, a wine list with surprising winemakers and price points, and a talented crew in the kitchen. We look forward to welcoming you to our new place!